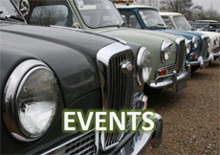 Following three victories at Goodwood Revival, JD Classics took another victory and a podium this weekend at Spa. 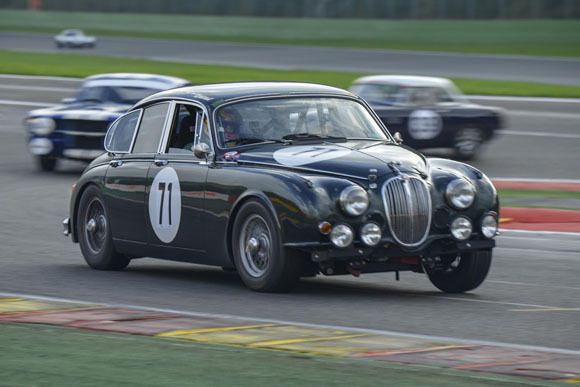 It was also the first time the Maldon-based team had entered the main Spa Six Hour race, putting in a strong performance after a mechanical problem in qualifying, and rising more than sixty places to finish 30th. 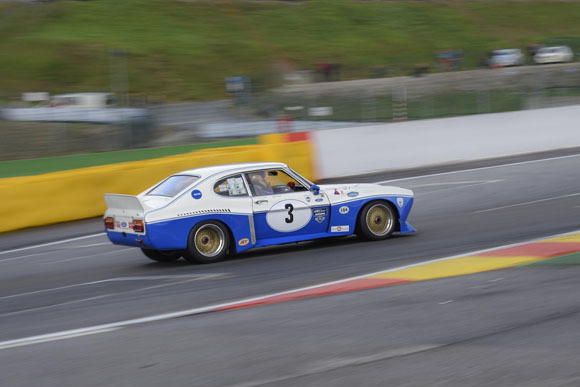 JD Classics’ victory came in the Historic Touring Car Challenge, courtesy of the team’s iconic Ford Cologne Capri, which had already won both its races on this track in May during the Spa Classic. The Capri qualified in second place, with Chris Ward at the wheel, before beginning the race on slicks when most teams had opted for intermediate tyres. 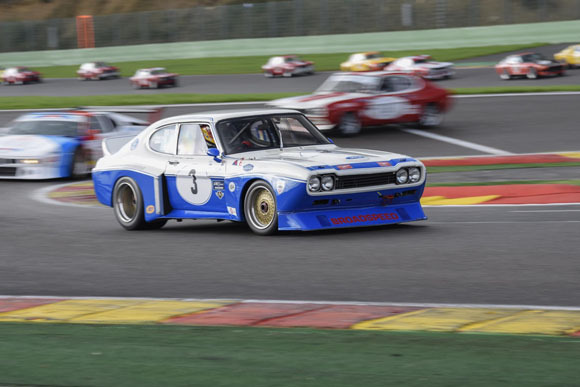 The damp starting conditions meant the Capri struggled off the line, falling back in to third place, but as the track began to dry out around lap three, Chris Ward was able to easily make his way through the pack and in to the lead. The team called Ward in for his mandatory 60-second pit stop on lap five, releasing him back in to fourth position. But the Capri’s pace was immediately obvious, as Chris Ward drove quickly back in to the lead to take a dominant victory. Another of JD Classics’ legendary cars on track this weekend was the ex-Fangio C-Type. Chris Ward was again driving, this time in the Woodcote Trophy qualifying session in a combined event with the Stirling Moss Trophy. 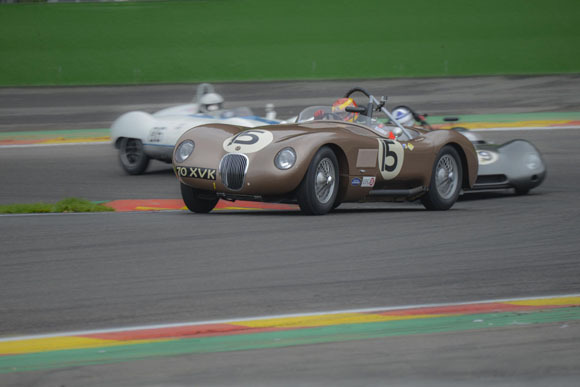 As the race began, the C-Type pulled away quickly but the second-place Cooper T38 was always challenging. The two cars battled hard until Ward and the C-Type were called in for the mandatory pit stop. 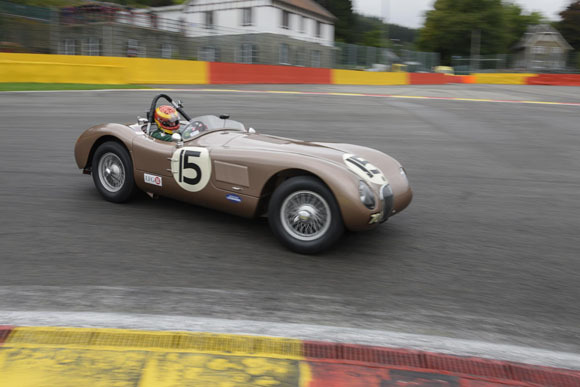 Rejoining the race in third place, the C-Type was now 14 seconds behind the leading Cooper T38. In an excellent show of driving, Ward cut the Cooper’s lead to just two-and-a-half seconds with 13 minutes remaining in the race, before finally making his move and snatching the lead with seven minutes left. The cars stuck to each until the final half of the last lap, when the Cooper managed to take the lead and a last-minute victory. 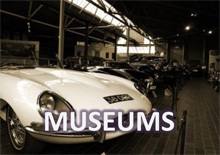 The C-Type still managed first-in-class, second in its race and 10th overall. 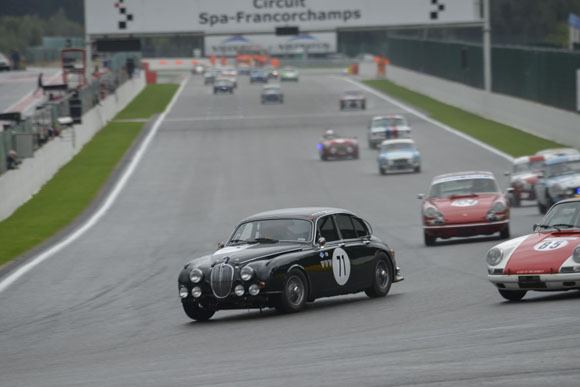 In the feature Spa Six Hour race, JD Classics entered a Jaguar MKII driven by Chris Ward, JD Classics MD Derek Hood and John Young. All three were due to drive a stint in qualifying but on only the second lap, John Young and the MKII fell victim to a half shaft failure. Nevertheless, with just one lap time set, the team qualified 92nd of over 110 competitors. JD Classics’ team of technicians quickly fixed the MKII, ready for the Six Hour race the following day. It was Chris Ward that took the wheel first, with him moving up from 92nd place to 65th. Shortly before lap 10, the Safety Car was out, bunching the field up again and by lap 21 the MKII was in the top third of cars on track. As Derek Hood took over and the MKII was refuelled, it re-joined the race in 51st place, holding strong in position for an hour before pulling back in to the pits for Chris Ward’s second stint. Despite a drive-through penalty on lap 60, it was only seven laps later that the MKII was running in 32nd place. 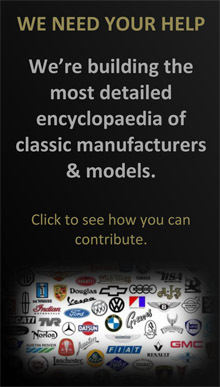 By the time Ward handed over to John Young for the final hour-and-a-half, the JD Classics car was in 29th overall and second in its class. Refuelling set the MKII back to 39th, before again coming in to the pits under a Safety Car so the team could fix some visibility issues. But the MKII’s pace was quick in the wet conditions and Young managed to cross the finish line in 30th place, and fifth in the class.